As beams pierce through the darkest night. While veils of darkness tear apart. Who overcame the dark within. Yesterday, I walked to find some peace and rest. The pictures above are from that walk. God allowed me to see tiny glimpses of His amazing love for us during this time of quiet and solitude. While life is certainly full of challenges, especially with six kids, Christ promised never to leave me nor forsake me. The Holy Spirit is a practical and real help in my day to day. I must only ask. His wisdom, hope, light, and peace are available to all who have placed their trust in Christ and His sacrifice on our behalf. In Jesus, we can live this life with glimpses of Heaven and a hope that one day all will be made right. Beautiful poem and pictures, Heidi. Beautiful God 🙂 Thanks for stopping in, Bill! Your poem deeply touched my heart, Heidi. As you know, my mother recently graduated to heaven. During the week she was cared for by Hospice and leading up to her celebration service this past Saturday, I frequently witnessed God’s Light piercing through the darkness of uncertainty, difficulties (care for my dad), and grief. But always, underneath as a sure foundation, was His hope and peace. Praise God for his gracious provision! I do praise Him with you for those provisions. I remember a quote (and am not sure who said it) that goes something like this, “Remember in the dark what Jesus showed you in the light!” This has been a powerful reminder, that no matter how dark it gets, our Savior’s Light is sufficient for every situation and problem. Thank you for always pointing us up-ward toward Christ, dearest Nancy! I live in Wisconsin near a Christian conference center. I have made it a habit to drive there (only 10 minutes away) after I drop the kids off at school. That time has become so valuable for me. It seems that God has taken that hour in the morning to help me see priorities and in that make my day more productive than before. Thanks for your comment, Jacquie. God indeed gives us wisdom and helps us see breakthroughs in our lives. The Holy Spirit is a real help to us. We must surrender all to Him. Blessings to you as you follow Him. Thanks again for stopping by. I love the beautiful pictures you captured that match your beautiful words! Thank you, Heidi! Heidi, I love how the light is streaming through the trees in your lovely pictures. And I love the Light He shines so faithfully for us to find our way to His will. Coupled with the early morning mist, the sunlight has been a marvelous display of the our Creator’s beauty! I was blessed to be at the right place at the right time. Blessing to you, dear Wendy! 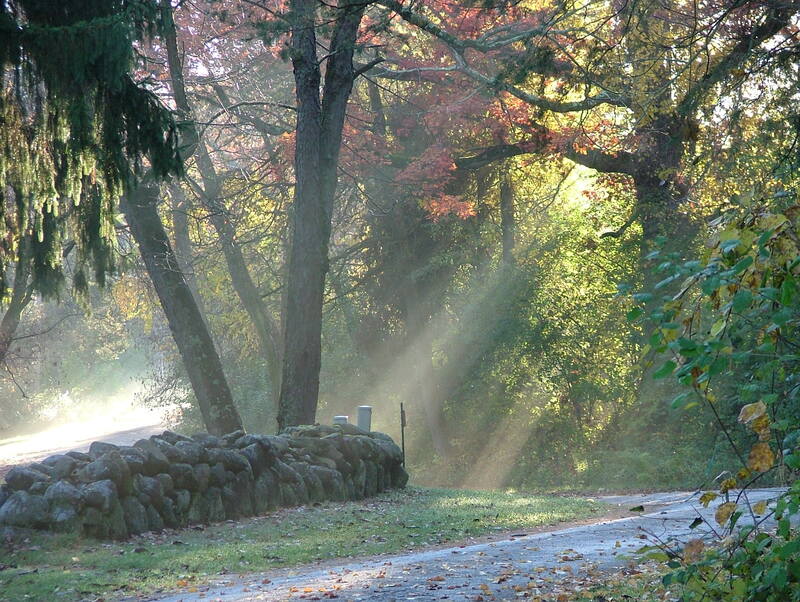 I so love that path, with its majestic trees and quaint stone fence! I can see very easily how your thoughts were turned to the divine from the mundane. Keep looking for Him wherever you go! It’s my favorite place to walk and spent time with Jesus. Yes, He helps us turn our thoughts from the mundane to the divine and holy 🙂 Blessings to you, sister! You are much appreciated!!! So encouraging and hope filled! Thank you for letting Him shine through you for us today! You are such an encourager! I appreciate your heart, as you let Jesus shine right through it 🙂 Sending much love your way! We serve a beautiful God, Liana, don’t we! Beautiful images and reflections! I love sunbeams! Thank you for your lovely Sabbath offering–hoping you and your family are well? I’ve passed this on to my Facebook friends and family to bless them too. Happy Sabbath! Thank you, dearest Kathie, for stopping in and blessing me with your encouragement~ Hope your week is blessed with glimpses of His mighty presence.